Last week, while I was at a friend's house and a garden visit, the UPS guy delivered some more plants. I am very impressed with the quality of the plants. I needed a lot and Seedland.com offered a great variety of groundcovers, in 3.5" pots. My order included Ajuga reptens 'Burgundy Glow' and Autumn Fern, Dryopteris erythrosora 'Autumn Brilliance'. I got a flat of each. So I got my little red wagon out, filled it with plant material and headed to the backyard. Looking at the photo at the top of the page you see a wide open palette. Along the left side of the garden area, down towards the water is a very shady area. This is the place that I planned to put a sea of ferns, Autumn Ferns. I put a Witchhazel in a week or so before, in an area that gets some dappled light. This Hamamelis x intermedia Feuerzaube gets large, so I gave it lots of room. In my planting/planning I have considered mature sizes and spaced accordingly. 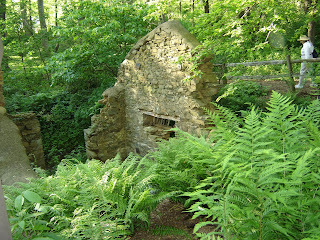 I spread the ferns out, looked from many angles, adjusted as needed and set about planting. I think the plants kind of disappear once they are planted. Next spring when they put forth their golden new foliage it will stand out . The next area was to plant the ajuga on the bank above the flagstone patio and along the stacked stone wall of the garden bed edge. The bank of the waterline/ patio area is in the shade in the fall but has a lot of sun in the summer. Most of the plants I have in there can handle both. As you can see I have some Knock-out Roses -- they are in the sunniest parts. I have Gaura linderheimeri 'Gaudwwhi' 'Geyser White', Loropetalum 'Daruma', and Rhus aromatica 'Gro-low'. The Rhus is a spreading groundcover that likes clay soil...spreading about 8 feet. I am enjoying the bright red fall foliage of this one! I planted the ajuga along the center of the stone wall -- giving it lots of room to spread out as well. Once again, after the plants are in the ground they seem to blend in with the mulch and leaves. My husband said he thought I was going to plant them along the patio but didn't see them after I was done....yes, they are there.......again, in the spring they will shine! There is more in the patio bed that will be talked about in another posting. I really like the Burgundy Glow ajuga, had some in Virginia. The tri-colored foliage is terrific and the little blue flowers it puts forth in the spring is just icing on the cake. 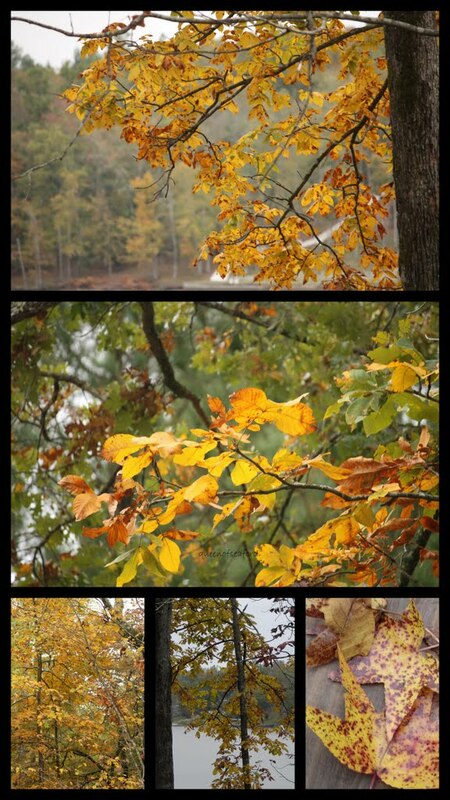 Before I take you into the next area of the new garden I wanted to share the beauty of our fall foliage. Sunday afternoon we took a drive to the Pig to get gas for the boat. 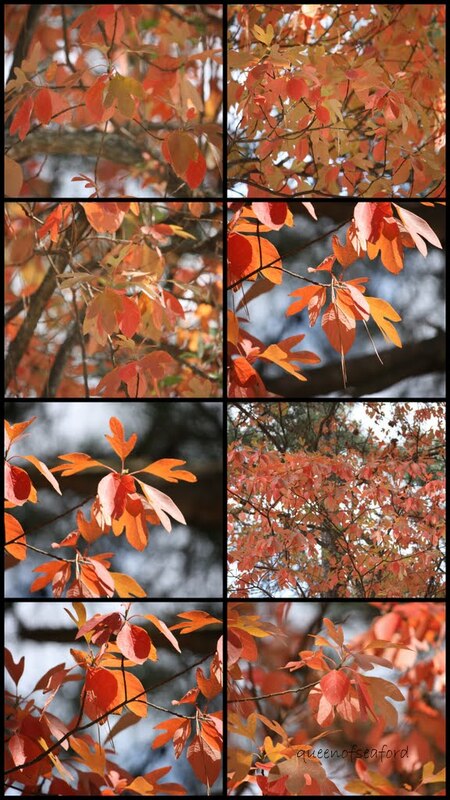 I took my camera with me and was able to get some photos of the wonderful fall colors. Sassafras albidum --in its full glory. I love the reds, oranges and peachy colors. Native Dogwood- Cornus florida, gotta love the red! All along the roadside is Sumac. 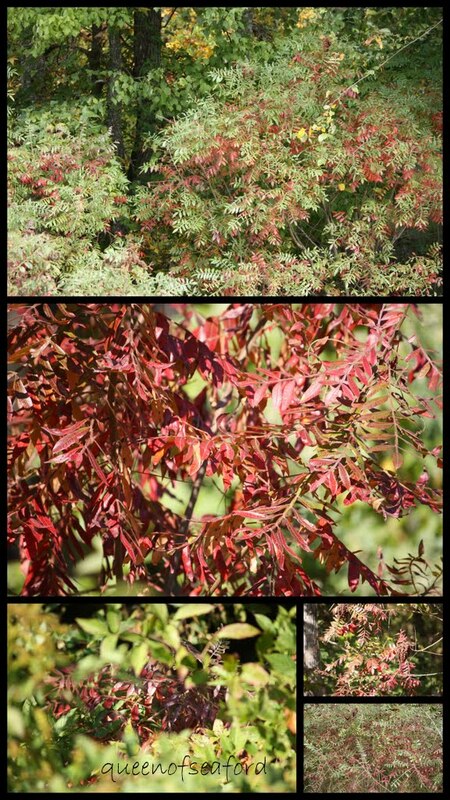 I believe it is Winged or Shining Sumac-Rhus copallina, again a brilliant red fall color. And of course we can't forget all the yellows in the landscape. I have a number of Carya around me, haven't ID-ed all of them yet. 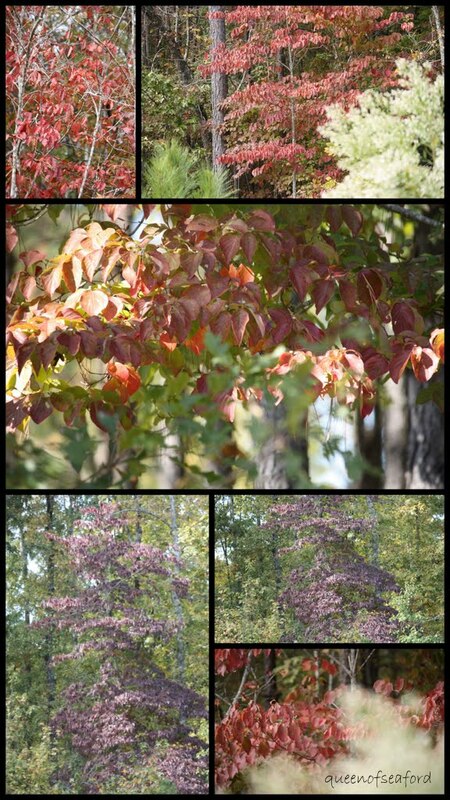 Some of the Sweet Gum are in their yellow phase as well as some of the red maple. 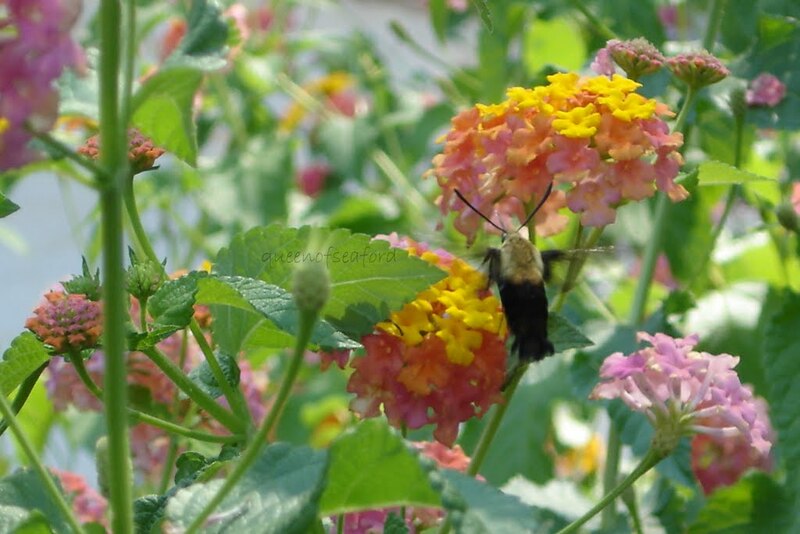 Be sure to check out The Fall Color Project 2010 over at Growing the Home Garden where every Friday there are more links to fabulous fall foliage all over. ﻿When we first moved in the foundation plantings were done. Along this side of the house I have Abelia x grandiflora 'Little Richard' and Deutzia gracilis 'Nikko'. I moved the 5 Hellebores into the back where there is more shade. At first glance we thought there would be more shade along the side of the house, but apparently not. In its place I planted the Peony I brought with me from Virginia. I was able to divide it into three clumps....they should do well there. Along the right hand edge of the photo you see the woods. It is someone else's lot, but until sewer comes to our subdivision, no one can build on it as it doesn't perc. Our property goes about 5 feet into the 'wild' at the bottom of the picture, gradually increasing as we move toward the cars and up to the street. I think at the street our wild area is about 30 feet wide. One of the first things I planted was a Jane Magnolia. She is planted at the corner area of the grass up by the parking area. While the soil doesn't look fabulous, it was workable and I added some amendments to the extra large hole Charlie dug. Additionally top dressed with some compost. We had a big rain and there was some washout around her stem. Knowing that Jane is a multi-stemmed plant, I thought nothing of the two stems at the base. HOWEVER, the more I looked and poked around, the more I was convinced it was two seperate plants. I dug it up and gently seperated the roots from each other -- now I have two Jane Magnolias, both along the edge of the woods. Working along the edge of the grass, in what is really the edge of the wild, I planted a Ninebark, Physocarpus opulifolious 'Coppertina'. My hope was to put one in the front of the house near our copper topped bay window. Our house front faces South and the Ninebark cannot handle quite that much heat, so it is tucked along the tree line. It gets morning through midday sun and late afternoon it is in the shade. Next to the Ninebark is a Viburnum x carlcephalum. Its roots were girdled (I know I should have checked, lesson learned) so this was another plant whose roots were untangled and manipulated a good bit. I keep an eye on this one, I think it will struggle a bit. Above you see the tree line that I am working along. I reclaimed some of the woods. I found some plants worth 'saving' and pulled a lot of Muscadine grape vines. On the photo below you can see one of the wreaths I made hanging in the tree near my compost bins. I found a small Ostrya virginiana, Ironwood, tree. It is really small--about a foot to foot and a half, but worth having in there. I also found a small Euonymus americanus which makes Charlie happy, he keeps singing "Heart's A-bustin'". There was also a small dogwood that I was happy to find. I did cut/pull some red maples and a few Sweetgum. I have plenty in the yard of both, just don't want them on top of each other. I also left in place a few Carolina Jasmine, Gelsemium sempervirens vines to add some color next spring. 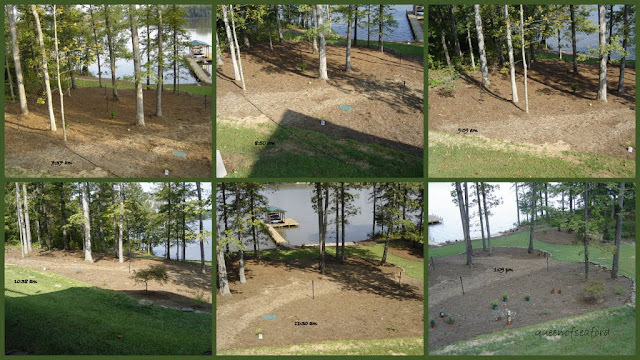 Once all the pulling and planting was done, I used what bales of pinestraw I had on hand and top dressed the beds. It helps define the beds and as the leaves and pine needles fall, it will add more to the top of the forest floor and my beds. I spread 6 bales (two days ago, spread lots more on other days). Near my 'queenofseaford' on the above photo you can see the viburnum and to the left of it is the Ninebark, already losing its leaves. I like having the natural area along side the house, I can look out the window above my little desk area and watch all the birds. Looking up to the parking area there is another green shrub that we planted. Viburnum tinus 'Spring Bouquet'. It is a compact evergreen viburnum and will add a bit of screening once someone does decide to build on the next lot. Here is 'Little Jane' --the second stem from my first Magnolia. In the landscape in the fall she kind of fades into the background. Pulling her apart from the other Jane didn't seem to stress her too bad. More garden planning - planting coming soon!! Come again. 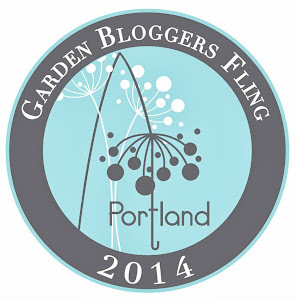 I am a few days late posting for October's Garden Blogger Bloom Day. I did take these photos on the 15th. I have a good number of plants blooming. The butterflies are still enjoying the blooms. Please go and check out more of the GBBD pictures on May Dreams Garden. Happy gardening! 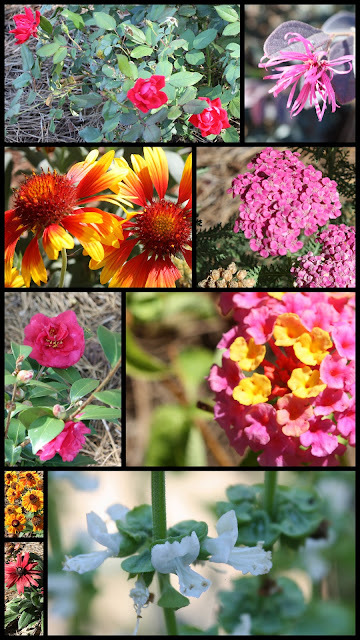 The blooms are- Double Knock Roses, Darum Lorepetalum, Gaillardia, Yarrow, Camellia 'Bonanza', Lantana, Helenium, Rudbeckia 'Cherry Brandy' and Basil. I have the variety names....somewhere. 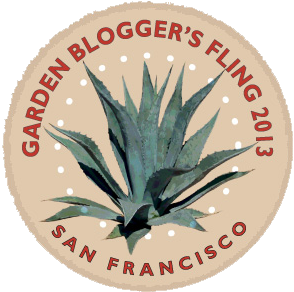 When I profile each garden section I will include the full names. This is just eye candy tonight. You know you have been away from blogging for a long time when one of your kids asks if you still blog. Well, I am back!!!! Retirement has kept us busy, busier than I thought. Besides getting settled in the house, we have been busy in the garden. To date we have put more than 200 plants in the yard. Many of the plants have been gallon sized pots....which means gallon sized holes. My hole digger is wonderful! Our first BIG project was to dress the side of the driveway. We had one of those storms that dropped about 2 inches of rain in 30 minutes. There was a lot of washout. As you can see we have rip rap along the edge of the driveway. The plan was to put some native grasses along the drive to slow the water. In addition to the grasses we added some junipers on the slope and a Crape Myrtle at the end nearest the house. Our trip to Lakelands Nursery made this garden possible. To make better decisions about where to plant what I took multiple photos of garden areas over the course of the day. I then compared them to some older photos I had from earlier in the summer –to take into account for the angle of the sun. Plant choices in mind, I made my purchases. Living in this part of South Carolina made for some great shopping for fall plantings. I spread the shopping all over the area. Wyatt Farms, the place that did our landscaping was one of my stops. Layman Wholesale Nurseries were having their fall sale, as was Park Seed. I did buy a few things online that I couldn't find otherwise. I will post more of the backyard garden in weeks to come. When we first moved in the night air was filled with the sounds of cicadas and tree frogs. 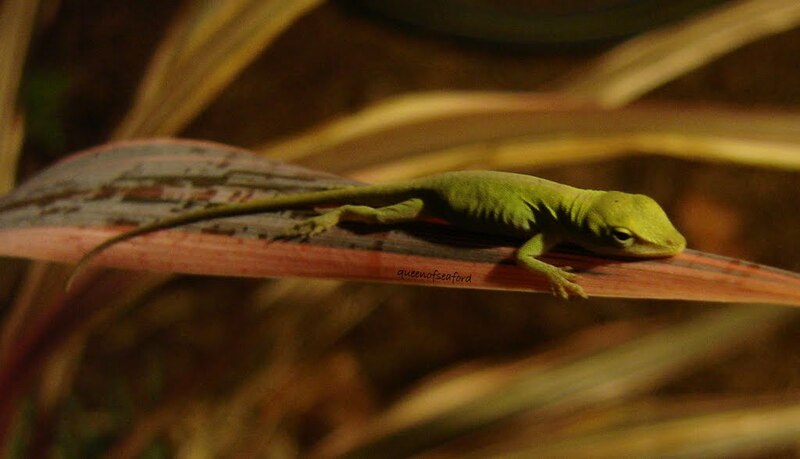 We have birds I have never seen before and lots of little lizards (or skinks or geckos or whatever they are). I have been enjoying all the nature that surrounds us. In addition to our gardening I have been attending Master Gardener classes in Greenwood. One thing this group does that I appreciate is pairing up MG interns with MG's. My mentor is super! She and I took a trip (about an hour) up to Clemson to the South Carolina Botanical Garden Fall plant sale....perfect!!!! I got to meet one of our fellow bloggers on this trip. 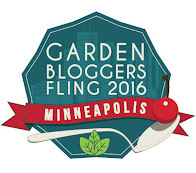 What fun to see Lisa from Natural Gardening. She was busy with the sale, so we only chatted briefly. Hoping to get up to Clemson again soon. The SCBG is really large and I look forward to exploring it. I am not sure how frequently I will get to blog, I hope be here regularly. I have read some of your postings on my Google reader, but promise to get back to visit and comment. This little guy is a Hooded Warbler. He hit my window and rested there a little while, then flew off.